The Tavern of the Taeguk Warriors is the brainchild of Roy Ghim, the “Old Tavern Owner”, who founded this website as a blog back in 2012. 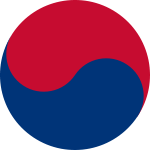 This is his first contribution to the blog, which tells the story of his love of football and how he strives through this universal language to reconnect to his Korean roots. The Taeguk Warriors is the nickname given to the South Korean National Football/Soccer team. Taeguk, according to all things Wikipedia, represents the origin of everything in the universe; holding the two principles of yin and yang in perfect balance; blue= negative, red = positive. Swirling together, infinity in movement, and united as one. The Taeguk design was used by ancient Korean civilizations for different purposes, evolving into a symbol for Korean Taoism. Tavern of the Taeguk Warriors was inspired partly by insanity – summers can be extremely hot in Maryland, this past summer of 2012 most definitely – but also a growing fascination with international soccer. The game is unique in our past century as a unifying international language. People can speak this common language despite enormous distances, lingual, cultural, and past differences. It unites and occasionally divides (with horrific consequences), but ultimately bonds people across the world. I experienced it first hand in travels to rural Ghana as the 2006 World Cup was under way. In the village of Peki near the Togo border, jubilation erupted, people were animated by the word of mouth, and gunshots punctuated the air when Assamoah Gyan nailed the first shot in a 2-0 group stage victory over a heavily favored Czech Republic. People came out and handed me beers. It was pure magic. At night, drumming was loud and constant; despite it being 4 in the morning, I came to admire the endurance of the absolute joy Ghanians had in this victory. Soccer wasn’t on my radar growing up; if it didn’t appear on TV, it didn’t exist. Fast forward to 2002: I had been up all night cleaning and moving out of one apartment in Denver and ready to couch surf at a friend’s apartment, one era of my life ending – when I tuned into a World Cup game between South Korea and the United States. It was dead of night, I think 2 am. This game caught my attention. I hadn’t really followed soccer and the sport here only gets attention every 4 years, like a presidential election cycle. The rest of the tournament for me is a blur, but I do remember a sense of delirium each and every time Korea came on the pitch. In spite of overwhelming odds, they clawed deeper into the tournament where no other Korean or Asian team had been before. With last minute sudden death goals, breathless penalty kicks, and edge-of-your-seat performances, they wrote their way most improbably into football history. I lost my voice yelling and screaming and jumping up and down. It was sort of like a religious experience; there could’ve been snake handlers nearby – and I would have joined right in, abandoning caution and dancing with joy amongst the lunatics. I had a renewed sense of something I really wasn’t in touch with previously, a growing awareness of a culture and pride in a tribe of people who had been marginalized by history. Yet there they were, survivors on the world stage. It was for me, transcendent. The Tavern is not simply about reliving such moments. It’s a present state of being and it’s open to anyone, Koreans and non Koreans alike – such is the Tavern’s international zoning. There is a focus on Koreans playing soccer of course, but not exclusively, there’s fun to be had outside of it. Additionally, Korean players as a whole seems to be passed over by western media outlets. Blogging, when done right, can be a way to illuminate the areas that the western media establishment under-report. The Tavern has several spotlights in order to raise the profile of Korean players within an western English language context. If there are any ulterior motives, it’s that in the process of running this Tavern/blog, I might be able to get closer to who I am by getting closer to my roots, I guess through blogging about Korean football. Doesn’t make sense to you? Me neither -and it doesn’t matter, ’cause I’m doing this anyway. So come by the Tavern and you might find me in the middle of a misadventure trying to learn the language, while simultaneously delivering bowls & dishes of news, rumors and exploits of Koreans at the highest levels of international soccer. Please be a part of all this -be a part of the conversation. The Tavern of the Taeguk Warriors can be a place to convene, discuss, analyze, wring hands, pound the table, watch the games together, express joy and regret, and hang out and drink –except that you can’t really drink here, no liquor license in cyberspace…yet.